Available Material: Brass, S. S. & M. S.
Sand Casting: Aluminum, Iron, and Steel. Die Casting: Aluminum, Magnesium, and Zinc. - DESCRIPTION: Machined from a single solid block on 4 axis VMC. We like to work with the material in stainless steel grade. We produced high precision machine parts in all the grades for stainless steel. While machining this products we keep keen attention over deburring and specified tolerances. Scraper Set for Marking and Surface Preparation. 3-piece set scribes metal and plastic, scrapes off paint and stuck-on gaskets, hooks and unhooks springs in difficult locations and more. We are offering to our clients awide range of HMC Machined Parts. A dedicated , customer focused, engineering design & manufacturing set-up has been created to develop custom design engineering services for clients. Finishes: Natural,Nickel,Tin,Silver,Chrome Plated,Sand Blasted,Annealed,Acid Washed etc. or any coating as per customer specification. 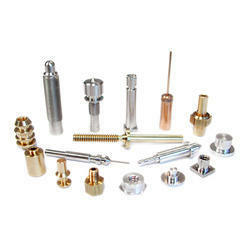 - Features Any kind of special turned parts can be made as per customer's specifications.